« Writing Songs with Kids: Get Inspired! Students get excited about songwriting with Liz! The next week, I told the students that sometimes people write songs to inspire change, especially when something makes them sad or angry. I taught them “If I Had a Hammer” and talked about Pete Seeger and the role of music in the American Civil Rights Movement. We also sang “Bling Blang,” a more playful hammer song by Woody Guthrie. As we tapped rhythm sticks for a hammer effect, I encouraged the students to think about the different meanings of the hammer in each song. 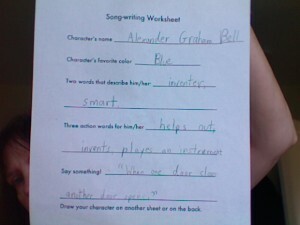 A student proposes a song about Alexander Graham Bell. 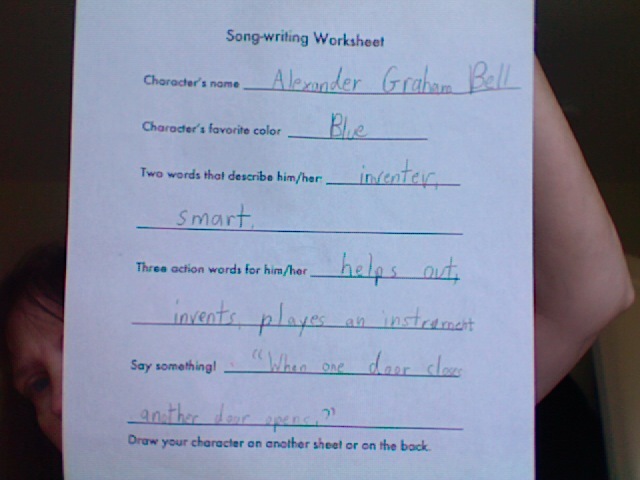 We next turned to songs that inspire us, and considered contemporary folk songs such as Jonathan Sprout and Dave Kinnoin’s upbeat tune about Thomas Edison, “The Light Went On.” This song has become a favorite with some of the children – one year it inspired a classroom to write their own similar song about Alexander Graham Bell. In the fourth and fifth weeks, I turned to world music and African American musical forms. We sang the traditional “John the Rabbit” (which I normally sing as “Peter Rabbit” – John and Peter are rather similar bunnies) and “Three Little Birds” by Bob Marley. 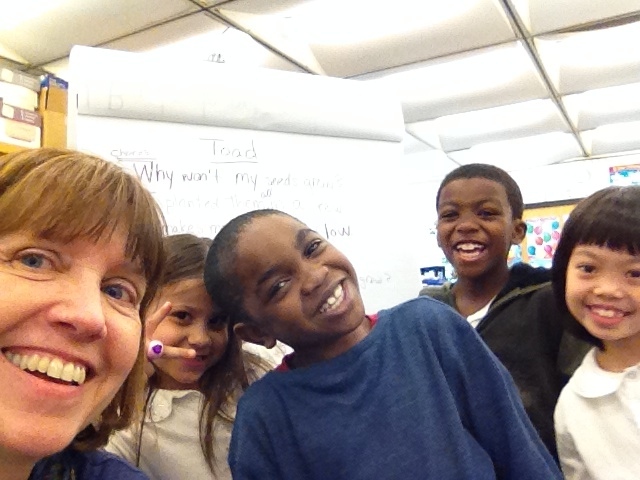 We talked about reggae and call and response songs. I also included a perennial favorite, “Señor Don Gato,” a humorous ballad thought to have Mexican origins. I also asked each classroom to participate in a quick songwriting exercise, to create a verse for my “Word Family” song, an activity I also do with kindergarten classes. The word families for kindergarten are pretty simple, including rhymes for top, tap, pit, pan, pot and dad. You can hear and purchase the kindergarten version of “Word Families” at Songs for Teaching. I assigned my first graders slightly harder word families for their verses: rhymes for words such as sight, down, found, hatch and team. I told them that since rhyming words are an important element in many song s, it is very important to be able to think of word families to help us make rhyming lines. It’s always fun to see the students’ enthusiasm as they sing me their class verses. 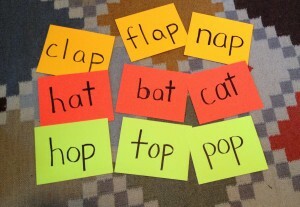 Plus it’s a way to involve classroom teachers in a simple songwriting exercise. Once they start tipping their toes in the water, they might jump in! 3 Responses to Songs that Inspire Us to Write More! Wonderful ideas Liz! Thanks for sharing such an informative blog.